Get a beautiful, healthy oak for shade to last a lifetime. Put our expertise and 25 years of experience to work for your shade tree needs today and find the oak selection that works for you and your property with us! Start with a healthy selection for an oak to last a lifetime. 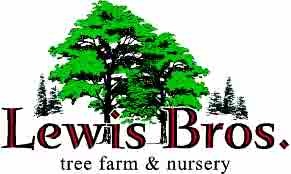 At Lewis Brothers Tree Farm & Nursery, we have many of the most popular selections of oak varieties to chose from. Call ahead to make an appointment with our nursery and peruse our selection of over 5,000 healthy trees. Full service delivery included. Optional installation available, to the best in post-sale service around. Our experts are here for you at every step of the tree buying process. From advice on fall foliage colors to hardiness, our professionals have the advice you need. The Bur Oak is a large, long lived tree with stout limbs, and open canopy forming a broad crown at maturity. Tolerant of a variety of moisture and soil conditions. It’s fringed acorns are larger than most and an excellent source of food for wildlife. Excellent for parks or larger tree areas. Is known to live up to 300 years old. The Heritage Oak is a cross between the English Oak and Bur Oak with outstanding vigor and superior form. This tough tree is adaptable to a broad range of soils. Excellent shade tree that maintains a central leader and develops a dense, uniform pyramidal crown. Crown becomes broad and rounded with age. Magnificent tree for larger landscapes. The Pin Oak is one of the faster growing oaks. This hardy oak is pyramidal often with a central leader, lower branches droop, middle are parallel to the ground and upper branches are upright. In old age, tree shape becomes more oval-pyramidal. Easily transplanted due to its shallow, fibrous root system. Will tolerate wet soils. Widely planted as a lawn and street tree. The Red Oak is a native, fast growing tree that can thrive in just about any soil, it provides abundant shade and has intensely bright red fall color. This valuable landscape tree transplants well. Withstands pollutants so a great tree for both the city and the country. Birds and animals dine on the acorns. 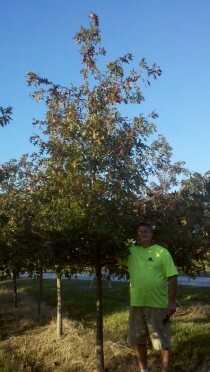 Excellent tree for lawns, parks, streets, golf courses and commercial sites. The Scarlet Oak is a large, rapid growing tree with a rounded, open habit. This tree is a very popular landscape choice for its tolerance of poor soils, wind resistance and vivid, red autumn color. This oak is long living, sturdy and considered to be a low maintenance tree to grow. Widely used in parks, large yards and along streets. The Shumard Oak is the fastest growing red oak. A large, pyramidal tree that becomes more spreading at maturity. It is long lived, drought tolerant and relatively easy to transplant. A majestic tree that will quickly add shade to your landscape and cool your home. Excellent wildlife tree. Acorns eaten by squirrel, deer, turkey and other wildlife. Swamp white oak is a striking tree with attractive peeling bark, especially on young trees. Native to eastern Iowa. One of the easiest oaks to transplant. Grow well in areas that are dry, poorly drained and wet, or occasionally flooded. Tolerate substantial soil compaction. An excellent shade tree for any landscape.